Simply the fastest, easiest way to order contact lenses online. If you live in the San Fernando Valley and wear contact lenses, we look forward to handling all of your vision needs. Welcome to our online web store. From your computer, you can find information about our practice and order your replacement contacts at your convenience 24/7. By ordering through our system, we can better fulfill your vision care needs. This includes confirming that the order is correctly placed and filled. There’s nothing worse than starting your day with an empty contact lens box. The funky back-up glasses come out, and panicked phone calls are made to expedite your order. Save the hassle and let us help you keep your contact lenses fully stocked. And, if you need a better looking set of prescription eye wear, Dr. Leonard’s team can help with that too! 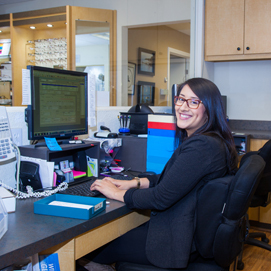 In the office, online or over the phone, our team strives to be the friendliest optometry team in the valley. We get it. Even though Dr. Leonard’s optometry office is conveniently located off the 405 in Panorama City, you can’t beat the convenience of the internet. Order your contact lenses online. We’ll ship them right to your door. If there are any questions about your order, a friendly eye care expert will call you to confirm. Selection is important. That’s why Dr. Leonard carries specialized contact lenses for virtually any eye condition. Contact lenses for Keratoconus treatment? Yep, we’ve got ’em! And for those of you with funky corneas, your scleral contact lenses are just a click away. Order contact lenses online (even the specialty ones) and we’ll have them ready for you! If you have any questions just click on “Contact Us” and send us an e-mail. We look forward to your continued patronage and as always, please feel free to call our office at 818-891-6711 at any time.